In our experience the general public, some of our students, and even some of our colleagues, are confused about the differences between the 47-member Council of Europe, the parent body of the European Court of Human Rights, and the 28 (soon to be 27)-member European Union, in human rights and other fields. Confusion about the differences between the two organizations has also been compounded by increasing interaction between them, particularly over the past decade or so. The human rights-related literature is also dominated by separate studies, largely concerning their respective legal systems. As a result, more integrated accounts are increasingly required. 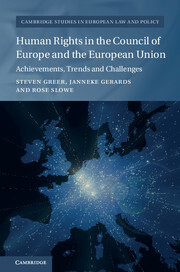 This is the primary objective of our recently-published book – S. Greer, J. Gerards and R. Slowe, Human Rights in the Council of Europe and the European Union: Achievements, Trends and Challenges (Cambridge University Press, 2018). In a nutshell, its core thesis is as follows. The central achievements of the Council of Europe and the EU in the human rights field are the successful institutionalization of their respective missions in both political and legal spheres. This, in turn, has contributed to securing, although not evenly or un-problematically, at least minimum human rights standards across the continent. The main trends are their expansion, and their increasing complexity, multidimensionality, and interpenetration. The key challenges concern how this could, and should, be properly understood, and coherently, legitimately, and effectively managed, particularly with respect to two clusters of issues, both descriptive and normative, which represent the flip sides of the same coin. First, to what extent if at all, are the autonomy, separate identity, and divergence of the Council of Europe and the EU in these arenas likely to be preserved as the 21st century progresses, and to what extent should they be? Second, to what extent if at all, are more integration, interdependence, convergence, and harmonization likely and desirable? Our main conclusions are that none of the four models which, in principle, map the landscape – ‘unification’, ‘separate development’, ‘organic convergence’, and ‘constitutional pluralism’ – applies uniformly in all spheres. Nobody seriously advocates unification of the Council of Europe and the EU, not least because 19 members of the former are not currently members of the latter. At the other end of the continuum, ‘separate development’ refers to the complete, and mutually indifferent, independence of both organizations from each other. But this is only possible in two limited spheres, external relations and legislation, where, by contrast with the EU, the Council of Europe lacks the requisite capacity. In between are two hybrids, each of which recognises that the two organizations are already linked in various subtle ways. ‘Organic convergence’ suggests that these connections should simply be allowed to grow organically without any guidance from any source. ‘Constitutional pluralism’ suggests, on the other hand, that the links between each are already framed by common, though flexible, constitutional values and that, in order to ensure overall yet pluralistic coherence, these should be more systematically and consistently observed by all relevant parties. Our study appears at a time of significant developments. The transnational protection of human rights in Europe, particularly on the legal front, is said to be at a cross roads with the centre of gravity in flux. For more than a decade, the Council of Europe failed to solve the burgeoning case overload crisis afflicting the European Court of Human Rights. While substantial reductions occurred in 2014 and 2015, the figures for 2016 and 2017 show further steep increases. But, in any case, even if caseload eventually diminishes to more manageable proportions, important questions concerning the Court’s effectiveness, authority and legitimacy – and its relationship with the deepening and widening rights mission of the EU – will remain. By contrast, the organizations which evolved into the EU took little formal interest in human rights for their first forty years or so. Then, at the beginning of the 21st century, these issues rose to the top of the agenda raising thorny questions about how this new priority might, and should, be reconciled with existing goals, and the relationship it should have with the long-standing human rights activities of the Council of Europe to which all member states of the EU, but not the EU itself, also belong. A much-lauded attempt by the EU to accede to the Council of Europe’s premier human rights institutions, the European Convention on Human Rights and the European Court of Human Rights, stalled, perhaps permanently, when, in 2014, the EU’s principal judicial institution, the European Court of Justice, ruled it incompatible with the EU’s foundational treaties. The continent has also been rocked by turbulence on other fronts in recent years. In addition to Brexit, those with ostensibly most relevance for our study have included the enduring age of austerity stemming from the global economic crisis of 2008, mass migration, an increase in the frequency of (mostly jihadi) terrorist incidents, and legitimacy problems stemming from these and other sources including populism, Euro-scepticism and rights-scepticism. However, neither ‘organic convergence’ or ‘constitutional pluralism’ provides off-the-peg solutions for any of the normative or other challenges each system faces. Nevertheless, in our view, the latter is the most attractive, particularly in the judicial sphere, because it permits the optimal, principled accommodation between autonomy, separate identity, and divergence on the one hand, and further cautious integration, interdependence, and convergence on the other. Arguably, this is particularly relevant for the UK which, in the post-Brexit era will remain a member of the Council of Europe, and will need carefully to disentangle the contributions of each organisation and to assess their impact.